A short history of the massacre of scores of Algerians in Paris on 17 October 1961 under the command of a Nazi-collaborating chief of police. In October 1999, the former Vichy official Maurice Papon, went into hiding in Switzerland rather than face ten years in prison for helping in the wartime murder of over a thousand French Jews. He was soon found by the Swiss authorities (amid allegations that he had once been a spy for MI6) and sent back to France to serve his ten year sentence. In 1998, he was found guilty of crimes against humanity in connection with the wartime deportation of 1,690 Jews (including 223 children) to Nazi Germany in 1943. He was the Vichy official responsible for Jewish affairs in Bordeaux between 1942 and 1944. There is one crime, however, which he has never been tried for: After the war, he escaped prosecution and between 1958 and 1967, he was the chief of police in Paris. 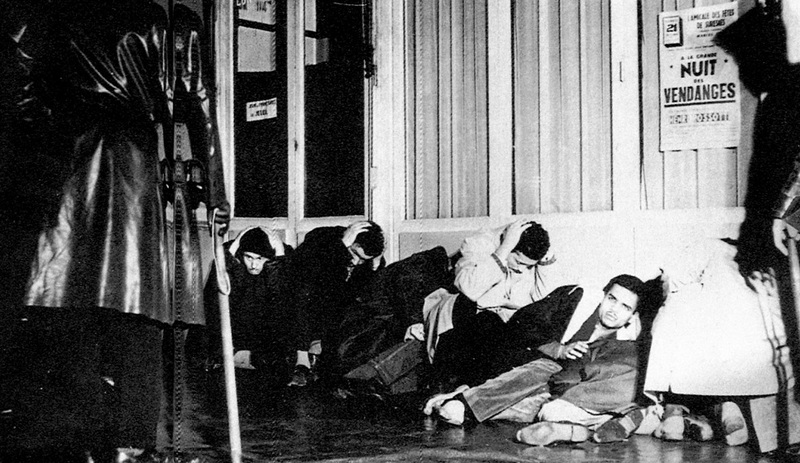 In October 1961, at least 200 Algerian civilians, were killed in Paris by French Police. In the three months preceding the protest, over 30 Paris policemen were killed by the Algerian National Liberation Front (FLN), a group fighting to end French colonial rule in Algeria. In response, Papon ordered a violent crackdown on Paris' Algerian community, explaining to officers that they would be protected against any charges of excessive violence. Police searched the Algerian ghettos for FLN members, indiscriminately killing at least five innocent Algerians. This led directly to the huge march that was organised by the Algerian community to protest at France's Nazi-like treatment of it's citizens living in Paris. The 200 deaths occurred after a peaceful march by some 30,000 Algerians was attacked by a 20,000 strong force of French police, and scores of bodies were later found in the River Seine, after it is believed, the French police killed them, and dumped their bodies in the river. These were not the last controversial deaths caused by police under Papon's responsibility. Four months later, in February 1962, Papon went too far even for the French President Charles De Gaulle, when French police killed five white French citizens at a Communist-led demonstration against the war in Algeria. 700,000 people marched at the funeral of the five protesters while a general strike shut down Paris. However, while the five killed in February 1962 became prominent martyrs for the Left, little was done to raise the issue of the 200 Algerians murdered by Papon's men in October 1961. "The police waited for the Algerians to come up out of the metro stations, made them stand still with their hands above their heads, then hit them with truncheons.... Corpses were found hanging in the Bois de Boulogne, and others, disfigured and mutilated, in the Seine... Ten thousand Algerians had been herded into the Vel' d'Hiv' [stadium], like the Jews in Drancy once before. Again I loathed it all -- this country, myself, the whole world" (Force of Circumstance, p. 599). "The Killing of scores of Algerians in Paris when he was De Gaulle's police chief"
It was during the Nazi occupation of France, that following a partisan attack on German soldiers, SS troops would massacre French civilians in reprisal (one such event happened in the village of Oradour sur Glane in 1944). Thus, the same happened in Paris when the police where under the control of the wartime quisling Maurice Papon. Before the massacre, 14 French police had been killed by Algerian guerilla movement, the FLN (which rose to become the first government in Algeria after the French were driven out in 1962). Over a million Algerians would die in the struggle to liberate their country from French colonial rule. French atrocities are well documented in Algeria, but few have suspected that a crime had been carried out in Paris comparable with the Nazi atrocities during the second world war. "We went to the upper floor of buildings and we fired on anything that moved . . . It was horrible, horrible. The man hunt went on for two hours - it was terrible, terrible, terrible. We finally went home because there was nothing left to fight" (2). The violence against the demonstrators took place in several incidents. The French police opened fire on the streets killing Algerians, after which they are alleged to have dumped the bodies in the River Seine. Out of 10,000 Algerians that were arrested, some demonstrators were not heard of again, and it is presumed that these detainees were taken to a stadium and to police headquarters next to the Seine River, from which dozens of bodies were later recovered. One police chief said his men had responded with "understandable aggression", feeling they were finally able to confront the FLN. They "took good advantage" of the opportunity to "liquidate their dispute," with the Algerian population of Paris. "It was horrible, but Papon said he would cover for us" (1). "There was no reason to hold back"
Later, there were so many bodies on the streets afterwards that police officers and their commanders argued over whether to leave them on the spot or to try and get rid of them. Most historians now agree that the police simply threw them into the River Seine. Papon's actions in 1961 are covered by a general amnesty and the whole incident have never been the subject of an official inquiry. Although he became a French cabinet minister in 1978, he was forced to resign in 1981 over revelations of his wartime collaboration with the Nazi's. This has also been corroborated by some French police at the demonstration. They later stated that Algerian demonstrators had been thrown into the River Seine. There appears to be an inconsistency with Vichy collaborators being tried for war crimes - whereas there are no prosecutions for those involved in the Paris massacre of 1961 ? Confirmation of the sensitivity of this subject was revealed in October 1998 when French police seized the edition of the Algerian newspaper Liberté that contained an article about the massacre to prevent distribution in France. The incident confirms a long disturbing history of brutal racism that prevails amongst senior levels of the French police and the establishment, notably against France's North African population. According to a report posted on the website of a South African Daily Mail & Guardian newspaper (February 11th 1999), a mass grave which could contain the remains of Algerians massacred by French police during the independence war has been discovered by two journalists in a Paris suburb. The remains were found in a former rubbish tip and may be those of Algerians who took part in a demonstration in Paris on October 17 1961. The newspaper reported how "the protest was violently put down by the police and many bodies were later recovered from the Seine River while hundreds of people disappeared". It reported the official death toll of the demonstration as seven people but this was updated to 32 people in 1998. The grave was uncovered after a retired police officer told journalists that he had taken part in an operation to dump bodies on the day after the demonstration. The weekly published its story about the grave on the day of the resumption of a libel action brought against French historian Jean-Luc Einaudi by the prefect of police at the time, Maurice Papon. In an article in the daily newspaper Le Monde, Einaudi accused Papon of ordering the killings. At the libel case, Papon admitted that repression of the protest was "tough" and that 11 700 out of 20 000 people were rounded up. Clearly the French authorities are still sensitive about this whole matter and it remains to be whether any steps will be taken by Paris to remember permanently the 200 victims of Police repression in October 1961. Either way, the Nazi-collaborator Maurice Papon was never prosecuted for these crimes, and it is shameful that De Gaulle, who led the French resistance against the Nazi occupation should have allowed the political rehabilitation of this war criminal after the war when he should have been put on trial for his participation in the Holocaust. 3 The Observer, 24th August 1997.